time is literally flying and “month of love” May is very much over. Reading books is keeping me inspired to “ship” more and more Inspiring Shipments for you. So, let me reveal to you which books were keeping me awake last month. My thumbs got almost numb, when I have read 1st part of Stieg Larson‘s “crimi-thrilly-trilogy”: The Girl With The Dragon Tatoo (affiliate link) on my Kindle (I did not know that book has 600+ pages). I got totally hooked up with the story and super cool character of witty-smart-outcast girl Salander. Guess, what I am reading now? ;-) Yes, 2nd part of Larsson’s trilogy is coming to its end at the moment. 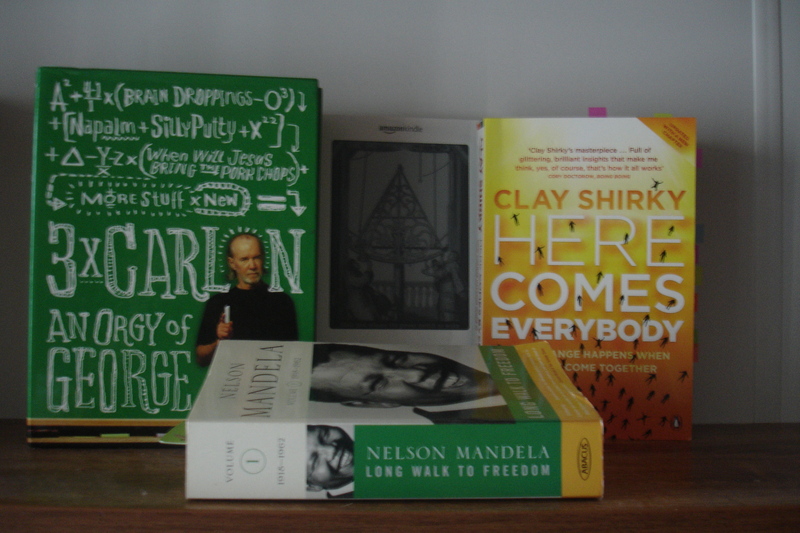 Long Walk to Freedom and its Volume no.1 (affiliate link) took me all the way to South Africa. I have captured many great quotes by Nelson Mandela, but I will share it with you as soon as I will finish Volume no.2 of his life’s journey. Certainly it is a must read for everyone, who dare to lead. Last piece, which I have “digested” in May 2010, was Here Comes Everybody (affiliate link) by the man I admire a lot, Clay Shirky. I cannot wait when I will grab upcoming new book by Clay with a very promising title Cognitive Surplus: Creativity and Generosity in a Connected Age , which is due to 10th June, yay! ...For most of modern life, our strong talents and desires for group effort have been filtered through relatively rigid institutional structures, because of complexity of managing groups. ...Now: Newly capable groups are assembling and they are working without the managerial imperative and outside the previous structures that bounded their effectiveness. …Loosely structured groups operate without managerial direction and outside the profit motive. It is easier for casual contributor to add something of value, as there is no institutional dilemma. …Capability lies in hands of everyone who owns a computer. …The hallmark of revolution is that goals of the revolutionaries cannot be contained by institutional structure of existing society. …Wikis grow, because people care about them. Have a generous, caring and collaborative week ahead, my dear SCG! Nice suggestions. I’ll put some on my ‘to read list’. I have read A Long Walk to Freedom a while back, and it is a great book. Amazing story from a very inspiring man! I cannot wait to finish “Mandela’s journey” as well. Yes Ivana it’s well invested time, and the result is so good. Love the quotes of the month as well.